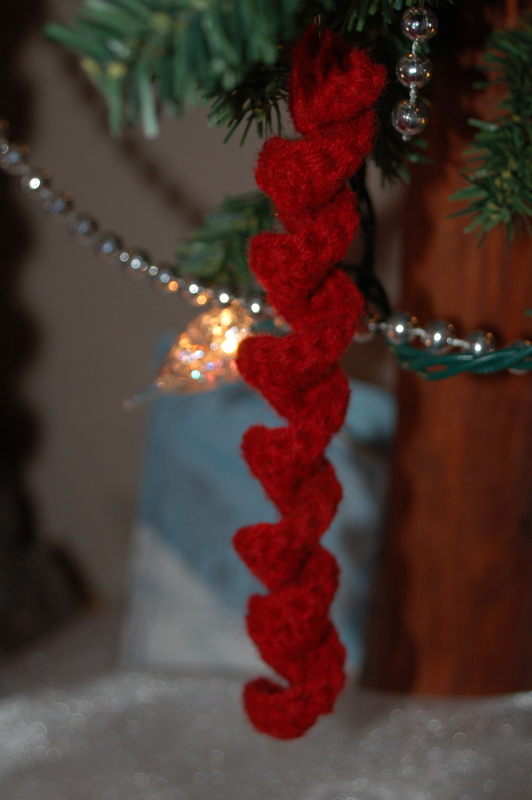 We don’t usually do much to celebrate Valentine’s Day, but I came across this crocheted heart pattern (by Lucy of Attic24, Teeny Tiny Hearts (Ravelry link)) and just knew I had to try stringing them up. So, I did. 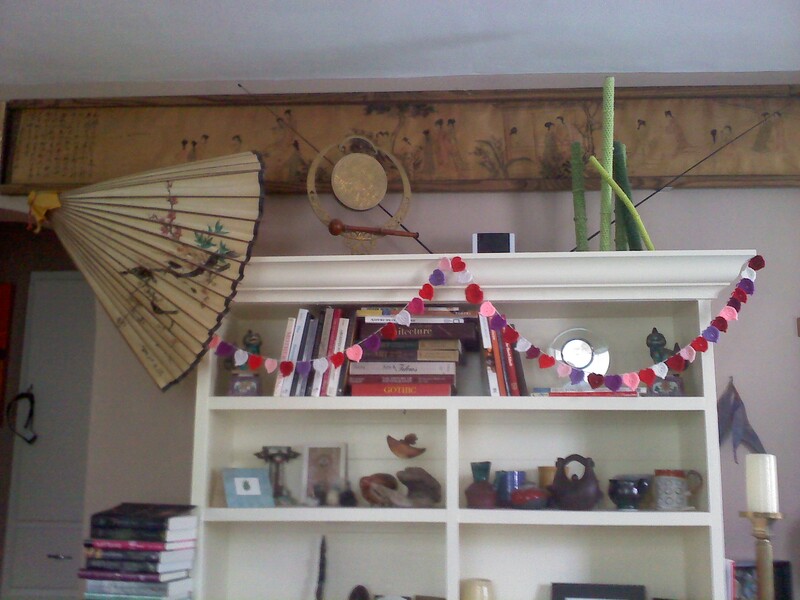 On Friday I pulled the Valentines-y colors from the scrap bin and started hooking. Stowing it all away over the weekend so it would remain a surprise for Paul was hard. 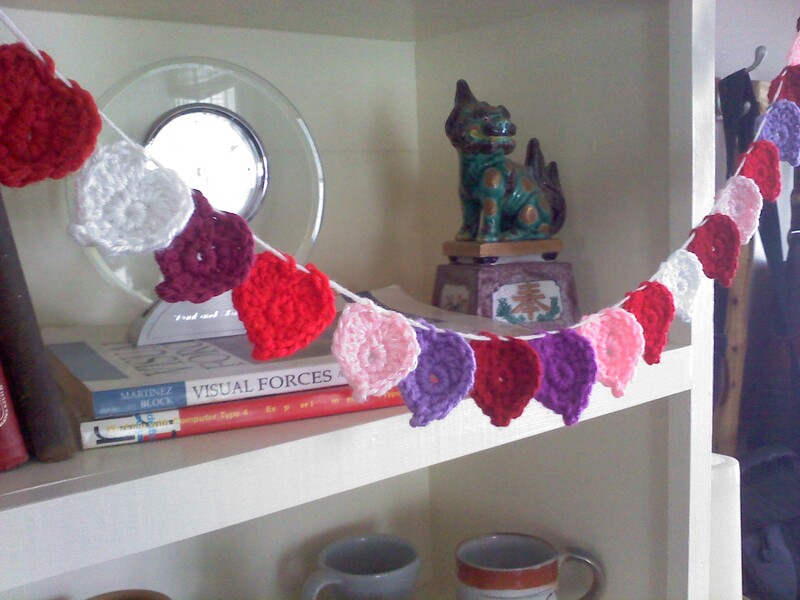 Then, Monday, I was crocheting in earnest. 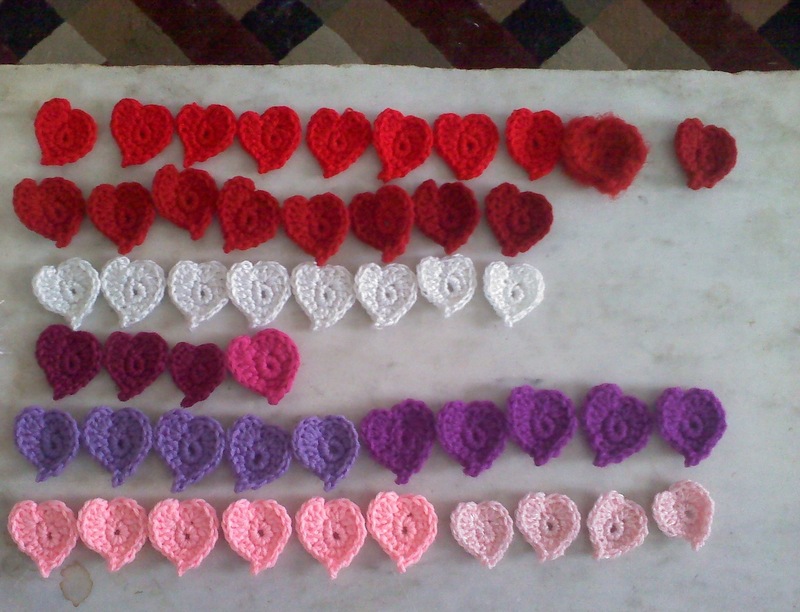 The hearts whip up quickly, each one took me less than 10 minutes to complete. When I reached 50 — the number I’d estimated I would need to span the chosen space — I stacked them all up, grabbed a ball of neutral yarn and my needles and came upstairs. To borrow Lucy’s phrase, ta-da! So, what do you think? 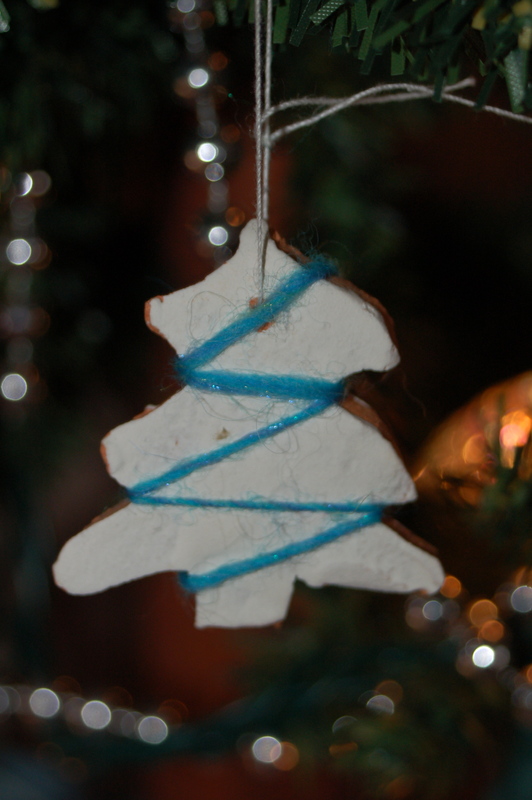 I thought it added a touch of fun, of whimsy. I thought the variations in the hearts (they’re not all the same size, some of them are actually duo-toned) would be more visible, but that’s OK. Happy Valentine’s Day! I appreciate you! Note: I’m probably more behind on telling you about my fiber arts endeavors than I am about my bookish ones, but I’ve finally got another post (or two) almost ready to go, so hooray! Before I fell full-bore into gift knitting (now thankfully done! 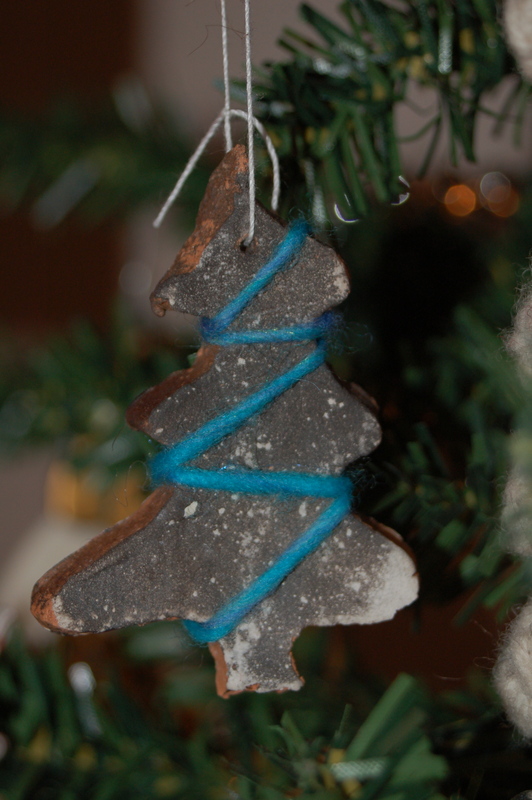 ), I was getting into the Christmas spirit by making ornaments. Click any photo to view it larger. These are the first ones we made. 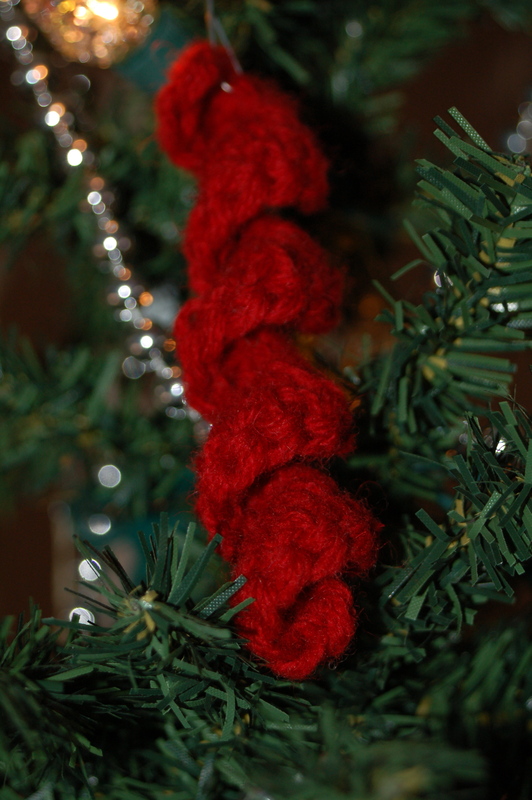 Paul shaped and slipped the trees, and I strung my handspun yarn as a garland. I especially like the bit of sparkle and variation in the yarn, as well as the highlight the edges of the trees themselves bring. I love it when we find ways to collaborate in craft! We may iterate on this idea more in the future. Again, click any photo to view it larger. 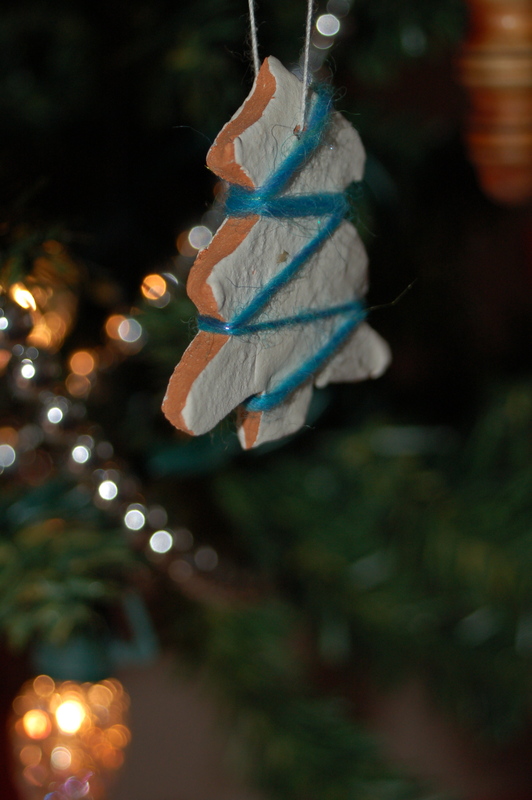 I pounded out quite a few of these; they’re kind of the unifying element on our personal tree this year. They come together really quick, too; I was getting four or so done in an hour. They’re a variety of lengths. With a hook size suitable to the yarn (I used a G or H hook with worsted weight yarn), Ch — loosely! — a number approximating the desired length of your icicle. I had good luck with 18 or so. Any shorter than 14 I found less than ideal. Working in the fourth ch from hook, 3 dc. Work 3 dc in each ch to end. 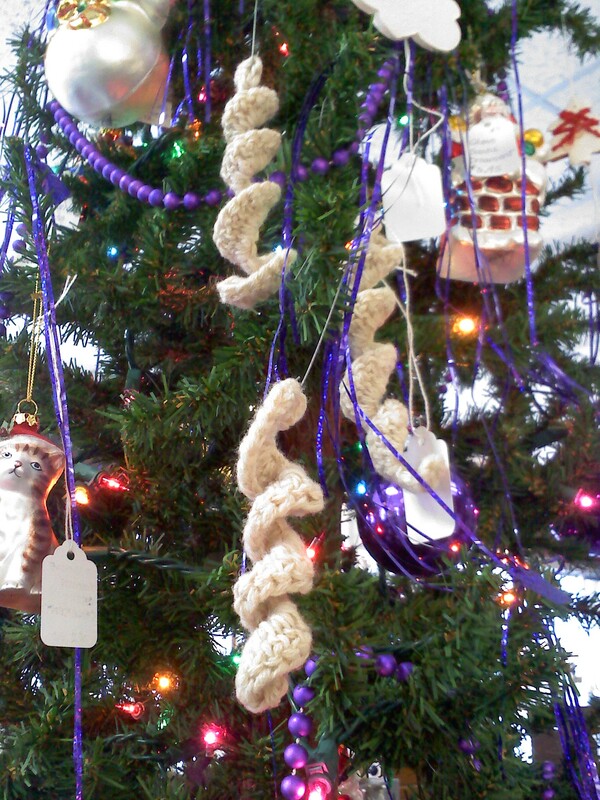 Break yarn, weave in ends. This is an idea not fully come to fruition, I think. I like where it’s headed, but I’m not sure when I’ll have more time to devote to it. I crocheted the stainless steel and threaded a bit of undyed combed top through it. I’m so very pleased to announce that my first knitting pattern has officially been released! Hedgerows Shawlette is available as a free PDF download. An asymmetrical triangular shawlette, Hedgerows is perfect for that special 4-ounce skein of handspun yarn. It’s designed to let you use up all of your yarn, without worrying about weighing as you go along. It also works great for a single skein of sock yarn, and it is well-suited for variegated or self-striping yarn. It will show off a wide range of yarn weights, as well, from lace all the way up to sport or DK. Hedgerows in greys. Knit in Lion Brand Sock-Ease in colorway Rock Candy. I was spurred to create this pattern by the 4-ounce challenge, and although I started right away, with all my other commitments for the past few months I was working right up to the wire to get this done. But, I made it, yay! The yarn I used in the bright sample seen here is my handspun, made from Spunky Eclectic CorriePaca (80 percent corriedale, 20 percent alpaca), in the Twenty-Ten colorway. My two-ply yarn measured 13 wraps per inch. Fractal-spun two-ply CorriePaca in Twenty-Ten, fiber from Spunky Eclectic.